While I have a general plan that keeps me tracking on my writing projects, sometimes the story just pulls you along. Steven Pressfield would probably call that The Muse. Many call it ‘flow’. For me it was just joy. I have three major tasks set before me this season with Thorium Publishing: mature and grow the business end of operations, finish book two, Exiles of Heaven, and start and finish book three, Map of the Stars. 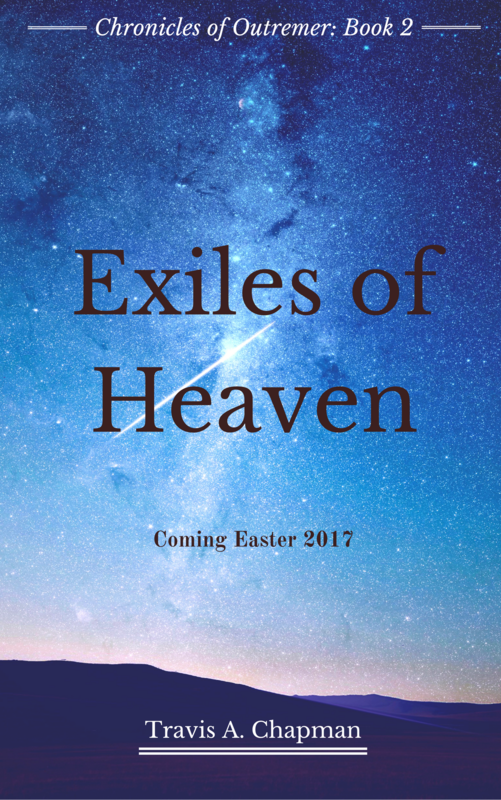 Now Exiles of Heaven is that much closer! My bet with Ken is a good motivator, but I’m willing to suffer wearing my Three Wolf Shirt in order to produce good books in my own timing. Plus, Exiles of Heaven needs to be finished next; that would otherwise just be silly. So I’ve been parallel working my edits to Exiles and initial idea incubation for Maps the past few weeks. This past weekend I started editing the latter half of Exiles and got caught in the whirlpool. For me, it’s really good. I’d finish a chapter and think, “I should stop and do this chore,” but couldn’t tear myself away. I wanted to see the story finished. I was drawn in and couldn’t stop reading. That feels really good! I finished the second draft and am now shifting into the beta reader and formal editing modes. Everyone should keep their fingers crossed for an Easter launch! I also spent some time over the weekend working on a completely useless but undeniably valuable and fun project. As a kid I ran around the woods surrounding our farm wielding whatever melee weapon I could produce from scrap materials on hand. Sticks became barbarian clubs. Pitchfork handles became spears. I found an old steel framing square that, once cut down with a hacksaw and put to the grinder, became a perfect two foot long Roman pugil sword complete with wood and sheepskin sheath, horseshoe-sourced hilt, and a blade fine enough to terrorize the maple saplings of our farm. It wasn’t just a matter of beating up trees with whatever I could find; it was the act of creation as well. Since 2014 I’ve collected a good kit of armor for wearing at our local Renaissance Festivals (having borrowed a friend’s and realizing that participating was 1000 times better than just attending). I’m OK with the idea of paying someone else for their skills and effort with things I’m not great at or don’t want to undertake. Could I make a chainmail hauberk? Sure, probably. Do I want to? Not really. One local festival will allow weapons to be worn if peace-tied. This past year I wore a crowbill on my belt, but a knight should really have a sword strapped to his hip. Kind of a distinguishing feature. I could buy one, and I probably will at some point, but I wanted to do something for myself. I had already collected most of the pieces-parts over time. My workshop is pretty well stocked with tools from my sailing adventures and growing up farming. Nothing fancy at all: that’s on purpose too. 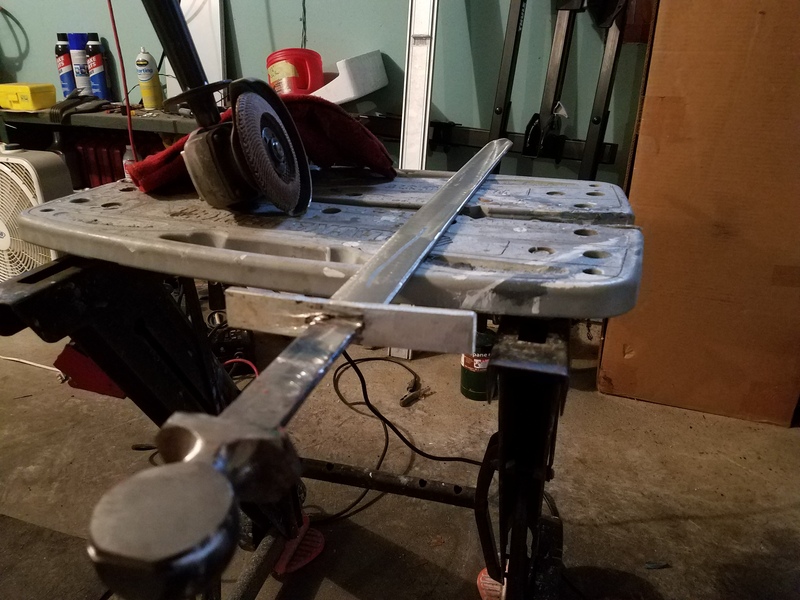 Just some bar stock, some scrap material, and an old ball hitch with a rusted shank that couldn’t be used for towing any longer. Now it was just a matter of setting aside the time to do things. I’m not done, not by a long shot, but I had so much fun making this thing that words can hardly describe it. When I finished welding the pommel I spent minutes in the driveway just swinging away, testing the balance, feeling the heat draw through my gloves. In my mind’s eye, I was Balian the warrior-blacksmith, defender of Jerusalem (at least the Hollywood version); Aragorn holding Anduril, the Flame of the West, reforged and renewed. I can’t believe you made that. That is amazing!